By the time Eunice Gayson played James Bond’s girlfriend Sylvia Trench in Dr No and From Russia With Love she had already become one of the first reality TV stars. Her leading men included Sean Connery and Roger Moore, and she co-starred in a record-breaking run of The Sound of Music. 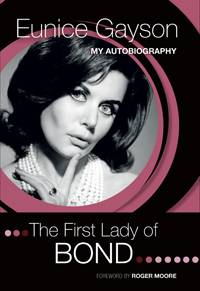 This is the inside story of an original Bond girl and some of the best-loved films ever made. Eunice Gayson is best remembered for co-starring with Sean Connery in the first two James Bond films, but her career also included appearances in such cult classics as The Saint and The Avengers, as well as starring roles in lavish stage productions of The Sound of Music and Sondheim’s Into the Woods. She married her first husband live on American television. With her second husband she had a daughter who appeared in the James Bond film GoldenEye. Now semi-retired from acting, Eunice divides her time between houses in London and Spain. Eunice’s website is www.eunicegayson.com.